Be the change! Be one with fitness! Pec flys are a great way to hit the centre of your chest. Lie down flat on a bench or on the floor with a dumbbell in each hand, resting on your tighs. 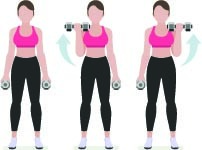 Use your thighs to raise the dumbbells up above you, with your palms facing each other. Slowly open your arms, keeping your wrists in the same position and with a slight bend in your elbows. 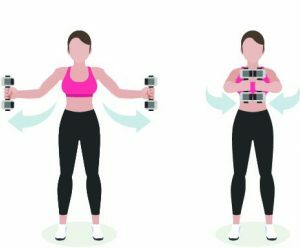 Tense your chest to bring the two dumbbells back up in the air and together, holding for 2-3 seconds, concentrating on contracting the centre of your chest muscles. . The movement should only occur in your shoulders, not your elbows. This is one rep. Bench press is really the king of chest exercises and it shouldn’t be ignored. Your pecks (chest muscles) are a very large muscle group. Working out muscles this size causes a big rush of hormones and biochemicals that help you burn calories, so don’t skip out! Sit up on a flat bench with a dumbbell in each hand resting them on your knees. Your elbows should be bent at a 90 degree angle. Slowly lower yourself backwards, whilst using your knees to raise the dumbbells above your body, keeping the 90 degree angle of your elbow and moving your elbows out to the side of your body, so your wrists are facing down your body. Tense your chest pecks and triceps, straightening your arms and pressing the dumbbells up in front of your body. Slowly lower them back down to the sides of your body. This is one rep. This exercise is great for working the back of your shoulders and your sides. Start with a dumbbell in each hand and hold them out to your sides whilst keeping your elbows in close to your sides. Tense the back of your shouldes. Rotate the dumbbells outwards whilst keeping your elbows near your sides. Slowly bring the dumbbells back in front of you until they touch. This is one rep. This variation on the crunch adds difficulty with a balance ball by removing some of your stability. Get into a normal crunch position, but place your lower legs on top of a balance ball. Remember not to pull on your neck or head. Keeping your lower back on the floor, tense your abs to lift your torso up, whilst tensing your glutes to pull the balance ball in towards you. Hold for 2-3 seconds. This is one rep.
Skullcrushers are a great way to get a tricep workout with reasonably light weights. Lie flat on a bench or on the floor with your knees bent or over the end of the bench. Hold a dumbbell in each hand straight out in front of you. Slowly lower the dumbbells towards your face until your elbows are at 90 degrees. Tense your triceps, slowly straightening your arms and bringing the dumbbells out in front of you. This is one rep. The jackknife is another great exercise for hitting the full length of your ab muscles. Lie flat on your back with your hands stretched out above your head. Engage your ab muscles, raising your torso and keeping your arms beside your head until the top of your crunch. At the same time, use your abs to raise your legs towards you whilst keeping them straight. When you’re at the top of your crunch, continue to move your arms around to the side of your legs, tensing your abs in this position. Slowly reverse this movement, lowering your legs and torso until you’re lying flat again. This is one rep.
Push-ups are a bodyweight staple exercise. They are great for working your chest and triceps. Place your hands shoulder width apart on the floor, making sure your hands are directly below your shoulders. Straighten your back and legs, standing on the balls of your feet. Slowly lower yourself down, bending your arms until your one or two inches above the ground. Make sure not to flare your elbows out too much. At most your elbows should be out at a 45 degree angle to your body. Tense your chest and triceps, pushing yourself back up. This is one rep.